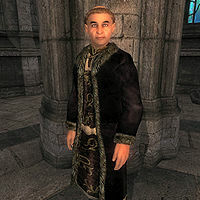 Kantav Cheynoslin, an Imperial priest, is the Primate of the Great Chapel of Zenithar in Leyawiin. The priests of Zenithar are said to have shown that the way to peace and prosperity is through earnest work and honest profit, not through war and bloodshed. Kantav lives up to this saying and spends most of his time encouraging the townsfolk to do the same. Like the other residents of the chapel, he sleeps downstairs in the chapel hall every night between midnight and 6am. After waking up, he heads upstairs for a moment of silence in front of the Altar of the Nine. He then starts his daily routine and will spend most of his time wandering around in the chapel hall while occasionally paying visits to the main chapel upstairs. He does this all morning until he finally leaves at noon for a two-hour lunch at the Three Sisters' Inn across the street. Afterward, if the weather is clear, he takes an afternoon stroll around town, preferably in the area near the house for sale. At 6pm, he heads back to the chapel, finds himself an empty pew and eats his dinner for two hours. After his meal, he once again leaves the chapel, this time to pay his respects to lost ones at the nearby cemetery. He returns to the chapel at 10pm and wanders sleepily around a bit before going to bed at midnight. If it is raining outside, he will skip all his outdoor activities and stay inside the chapel. On Sundas, he will break off his usual routine at 8am and pray for two hours in front of the Altar of the Nine. His wardrobe reflects his status: a black & burgundy outfit with gold trimmed shoes. He carries nothing but a large sum of gold. He possesses the standard leveled Priest spells, as well as one extra major Restoration spell. When you approach him, he will introduce himself: "Kantav Cheynoslin. I am the Primate of Leywiin [sic], and Zenithar's Advocate." And when you ask him about Leyawiin, his will share his faith and beliefs: "I believe in the transforming power of honest work. I honor your vocation as adventurer. By your labors and their fruits, you praise Zenithar." Kantav doesn't get much sleep at night and will rise from his bed at random times, wander around the chapel and go back to bed. This goes on all night long because his LeyawiinChapelSanctuaryExplore-package (with a 33% chance) runs all night long and takes precedence over his sleep package. Both Kantav and Silana Blandia will follow you around to keep you in line-of-sight as shopkeepers do because of an incorrect flag set on their AI packages.